RDS1+ Dampening: dampening laminate that runs along the full length of the edge. Twice as thick as other dampening systems in the Never Summer lineup. 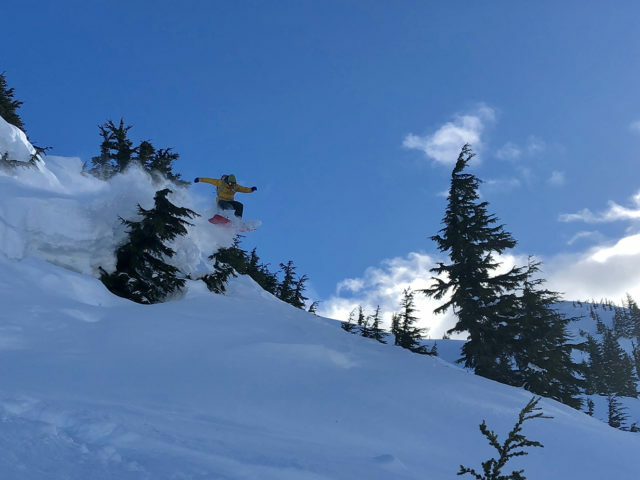 We’ve continued to see an increasing number of unique snowboard shapes designed around carving and surfing hit the market, and the Swift Split is one of Never Summer’s offerings in this category. The Swift Split is not only part of Never Summers’ “Shaper Series”, but it is also credited with being the inspiration behind it. Similar in theory to K2’s Enjoyer Series, the Shaper Series is designed around the purest form of carving and is meant to encourage fluidity on the snow similar to surfing. In their Shaper Series, the Swift is Never Summer’s answer for surfing deep powder. And while there are now many boards that are also designed for this, the Swift’s design takes a bit of a different approach. 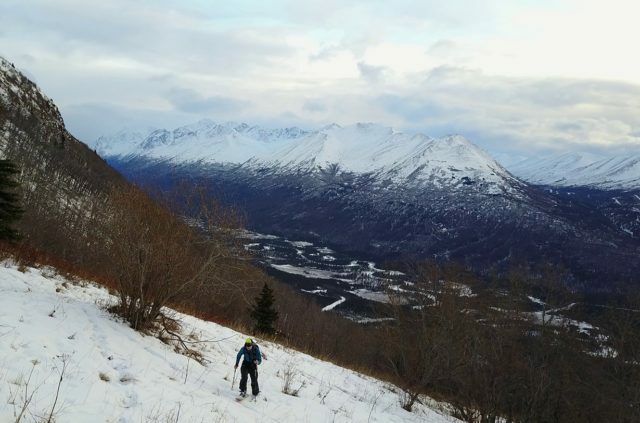 I’ve now spent a good chunk of time touring on the Swift Split in a variety of conditions in Alaska, and here I’ll go over how it’s performed on the up and the down, and how it compares to a few other similar boards. Never Summer boards have a reputation for being very tough and durable. While I am a huge proponent of durability, I was hoping the Swift’s burly construction wouldn’t come at the cost of additional weight. While it’s definitely not as light as the Amplid Milligram & Millisurf or the G3 Scapegoat+, the Swift Split did not feel especially heavy on the skin track. In comparison to other boards in its class, the Swift is roughly the same weight as the 154 cm Venture Euphoria, a little over a kilogram heavier than the powder-specific 161 cm Amplid Millisurf, and less than a kilogram heavier than the 144 cm K2 Split Bean, 162 cm G3 Scapegoat, and 163 cm Rossignol XV. Andrew Forward on the Never Summer Swift Split. One of the most notable features of the Swift is the Carbonium laminate, which is a beautiful fibrous topsheet that is designed to resist chipping — a very real concern along the tips and tails while touring. While I did not have any serious durability issues with the board, I was pretty surprised by how easily it scratched when I nicked it with a shovel blade when forming a jump. While it did not compromise the board in any way, it did not seem as resistant to scratching as regular or carbon-fiber topsheets. To further enhance the Swift’s durability, Never Summer protects its tip and tail with aluminum caps where skin clips attach, and it also features sintered p-tex sidewalls for hard impacts. The Swift feels snappy and torsionally rigid, potentially due to the many carbon laminates used in its construction. The Swift’s RDS1+ dampening system is comprised of laminates (twice as thick as the other dampening systems used by Never Summer) that run the full length of the edge to assist with high-speed stability and, coupled with elastomeric stabilizers located under the feet, add additional vibration absorption. It seems the dampening technology does an adequate job of keeping the board feeling smooth and reducing chatter, although I primarily rode the Swift in deep powder (where there is little chatter / vibration to worry about). However, hard landings from jumps and crossing firmer, set-up tracks never felt particularly rough on the Swift. The powder-specific shape of the Swift is what initially drew me to the board. It features a large and relatively wide (319 mm) nose that feels unsinkable, the most significant taper of the Shaper Series (average of 20 mm), and a supportive “bat” tail (similar to a swallowtail). My first ride on the Swift made me quickly realize how fast it is. While it is not how I usually become acquainted with a new board, my first few turns on the Swift Split set me up for a triple lineup of sizable backcountry kickers. I ended up underestimating my speed and over-cleared all three, a testament to how fast this board is. This experienced furthered my appreciation for a longer tail on a powder board. The Swift’s tail feels significantly longer and more stable than most powder-specific snowboards, apart from the Amplid Millisurf. While the shorter, stubbier directional shapes of the Venture Euphoria, Rossignol Sushi, and K2 Split Bean may be more maneuverable and create a unique ride, having a longer tail creates a more stable ride and adds floatation, resulting in a much faster ride with less snow penetration. The most comparable sidecut / board dimensions to the Swift is the G3 Scapegoat, but the Scapegoat features a very different nose and tail shape. Never Summer’s Vario Power Grip Sidecut utilizes multiple radiuses, creating extra contact points to provide greater edge hold. This design is very similar in concept to Lib Tech’s Magne Traction, Jones’s Traction Tech, and Rossignol’s Magtek. Never Summer’s rendition of a serrated sidecut does seem to feel significantly smoother and less catchy than what I have experienced with Rossignol’s Magtek. The Swift seems to track much straighter with less drag. Transitions from the shallower to the deeper-radius turns also feel much smoother and more predictable on the Swift compared to what I have experienced on other boards with similar serrated sidecut designs (although Jones’s Traction Tech feels pretty similar). The Swift Splitboard (and all the shapes from Never Summer’s Shaper Series) utilizes Never Summer’s Fusion Rocker Camber. 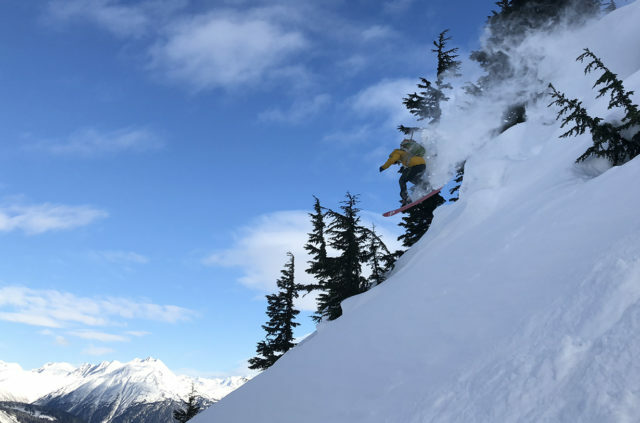 Basically, the Swift has rocker between the bindings, with camber beginning under the binding and reaching outward, and then it transitions to a relatively flat section before the tip rocker. The camber under the back foot seems slightly more exaggerated, giving the board a more directional feel. The Fusion Rocker Camber design is similar to Lib Tech’s C-cambers, but the Fusion Rocker on the Swift is even more directional. While I typically favor traditional camber between the bindings with a rockered nose, the Swift does ride and carve very well in powder and a variety of other conditions. The Swift’s nose seems to be rockered more than most boards, which furthers the board’s ability to punch through snow and float on top of pow. The rocker between the feet makes the board feel quick and relatively nimble, while the camber in the back foot can drive the board with ease. The camber feels very suitable and well designed to match the flex and shape of the board. Although the Fusion Rocker Camber is ideal for riding, I have found it rather problematic while skinning, specifically on firmer conditions. I will elaborate more on this in the Skinning section. 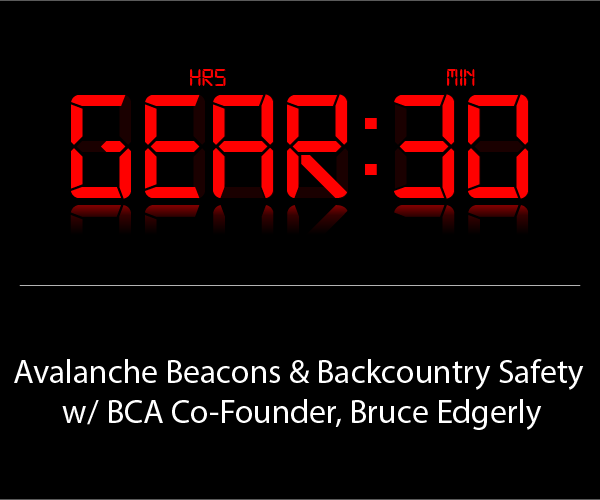 I generally prefer a stiffer setup for both resort riding on solid boards and in the backcountry on splitboarding gear. While Never Summer rates the Swift on the stiffer side (8.7/10), I’d say it’s about average for the general splitboard market, if not slightly on the softer side. However, it’s flex feels well matched for the shape and purpose of the board. The Swift Split feels snappy while riding and laterally responsive while touring. It does not feel as stiff as the Rossignol XV split, K2 Split Bean, or Jones Carbon Solution, and is only slightly stiffer than the Amplid Milligram or Millisurf. Overall, the Swift’s flex seems a bit on the softer side compared to most boards I’ve reviewed, but the Swift’s flex does complement the board’s design very well and gives it a very springy and lively ride, particularly in deep powder. The skinning attributes of a splitboard weigh heavily in my mind when deciding what board to use for the day or trip. After all, most of the day is spent skinning, which may or may not be enjoyable. While the Swift is on the heavier side of the boards I have tested, its weight does not seem to be a huge disadvantage. As I noted above, the Swift Split is roughly a kilogram heavier than the Amplid Milligram and Amplid Millisurf (two of the lighter, if not the lightest splitboards on the 18/19 market). However, it seems that the Swift’s shape and camber profile dictate the board’s skinning performance more so than its weight. The wide and pointed nose of the Swift does an excellent job of penetrating / porpoising up through deep snow and stays afloat for the most part. The significant camber, moderately stiff flex, and tapered shape help the Swift Split cut into softer snow and provide good grip. While the Swift Split skins well in soft snow, it seems less ideal for firm skin tracks, primarily due to its rocker / camber profile. I found that having the touring inserts (toe of the binding) located directly over the rockered portion of the board proved challenging on anything other than soft snow. I often found myself sliding backward more often than expected due to the limited contact area. I usually prefer traditional camber between the bindings with a rockered nose and tail for this very reason, in addition to the edge hold while riding. The exaggerated camber in front of the tail of the Swift’s Fusion Rocker Camber design does not seem to grip or conform well to firmer skin tracks. The rocker under the toe (while touring) also prohibits efficient glide in softer or firmer snow, and seems to dish / dig in. 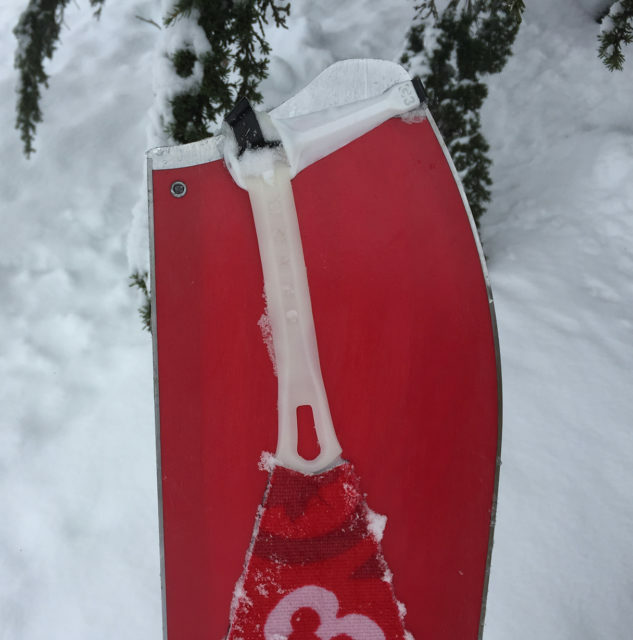 I primarily used the Swift Split with G3’s Universal splitboard skins, but I don’t feel different skins would really alleviate the problem — higher-traction skins would further prevent adequate glide, and better-gliding skins would be even more problematic on steeper, firmer sections. 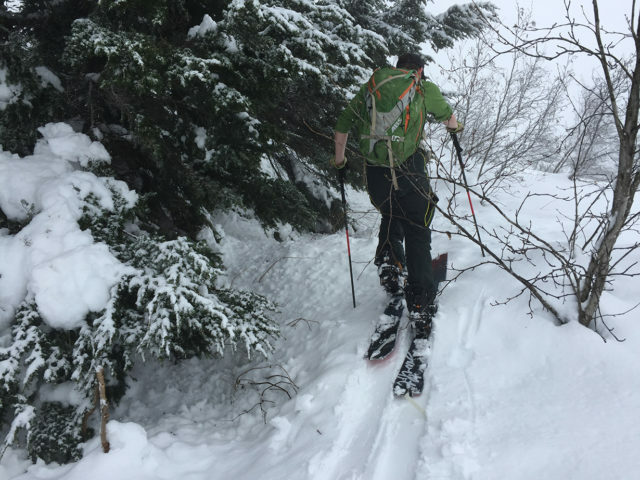 Having said all that, the Swift is primarily a powder-oriented board, and I found no significant issues with it if I was breaking trail or skinning on relatively soft skin tracks. Is essence, the Swift Split is a powder-carving machine. Its shape offers ample float in the nose area, while the significant 20 mm taper and bat tail help the aft region of the board sink down, keeping the tip high and on top of deep snow. As mentioned above in the Shape section, with the influx of shorter, stubbier, high-volume boards that are super fun and agile but not all that stable or fast, the Swift makes me really appreciate having a long tail for stability. Several times the Swift’s tail saved me from washing out after landing backseat off kickers and pillows, with the tail acting as a wheelie-bar and offering enough snap to help throw my weight back over the nose. The Swift’s tail also adds stability at higher speeds in deep powder and choppy, variable conditions. Overall, the Swift feels very fast and stable in powder. It reminds me a lot of the Amplid Millisurf (possibly one of my favorite splitboards ever), in that the Swift floats similarly and accelerates quickly. However, the spooned-out nose of the Millisurf creates an unmatched buoyant, surfy feel in deep snow, in addition to being more than a kilogram lighter than the Swift Split. The shape of the Swift gives it a versatile feel — the board felt quick and nimble while riding deep powder in tight trees and pillows while also being a very stable and a powerful carver on wide-open gully and alpine runs. The Swift’s flex is soft enough to maneuver the board through heavier powder and feels very lively and snappy, encouraging jumping off side hits and sending natural features. The Swift’s rocker between the feet also helps with agility in deep powder, while the camber under the bindings will help drive the board and cut sharply. Although there are many powder-specific shapes to choose from in the snowboarding world, from short and stubby to long swallowtails, the Swift is among my top-ten favorite shapes for riding in deep snow. The majority of my time on the Swift Split was typically spent in 1-3+ feet of powder, but the board seemed to do a good job of edging when crossing tracks and riding higher-trafficked funnel zones. The Swift’s floaty nose and significant taper coupled with the strong camber under the back foot made the board edge and traverse well across and through variable conditions (wind and rain crust primarily). I did not encounter much ice or hardpack while testing the Swift so I cannot speak to how well it will handle, although the board did seem to dampen chatter and vibration pretty well (especially compared to lighter boards like the G3 Scapegoat+). The Swift Split feels very carvy and grippy on smooth, chalky snow. The Vario Power Grip Sidecut seems very smooth and powerful, really letting me drive the edges deep into the snow. The feel of the sidecut was most notable on slightly firmer, soft snow where the board would really flex and engage the edges. It was noticeably smoother on carves, more intuitive to learn, and less likely to hook an edge compared to the Rossignol Angus and XV Magtek Split. As with firmer and variable conditions, I did not spend many days riding corn and spring conditions on the Swift. While riding sun affected “hot pow”, the Swift’s ride was very comparable to riding deeper, colder pow. The board floated well and felt exceptionally fast, once again, similar to the Amplid Millisurf. The Swift Split is an excellent powder-specific quiver board, or a decent one-split option for intermediate / advanced riders who tour primarily on powder days. 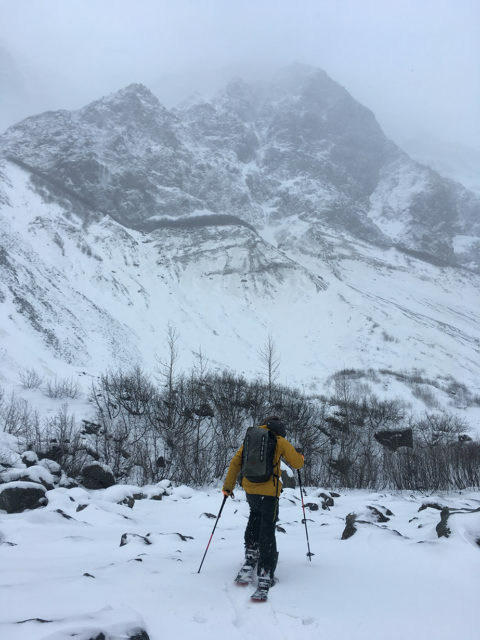 Apart from its inefficiencies while skinning, the Swift’s carving attributes are very impressive, and it seems like it would handle well while descending in a variety of conditions. 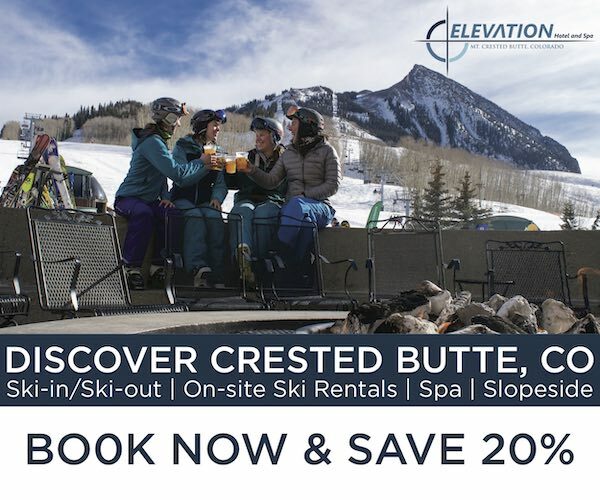 Impressive float, great responsiveness / agility without feeling squirrely, and stability underfoot all make this board an excellent option for powder days. 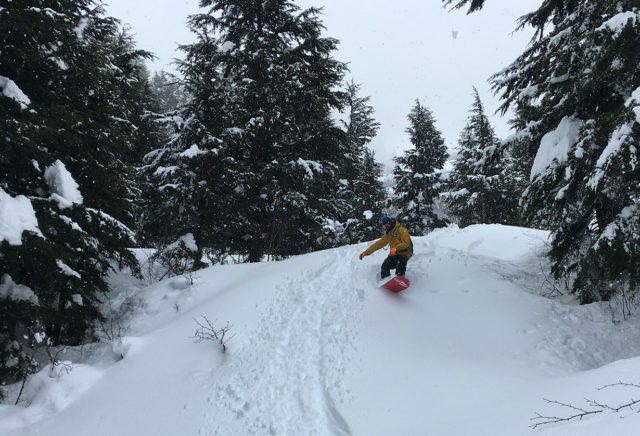 The Swift would be a great splitboard for intermediate to advance riders looking for a surf-inspired powder board, but who don’t want to sacrifice the ability to ride hard and fast. The longer, stiffer tail of the Swift makes it far more versatile than shorter, stubbier boards such as the Rossignol Sushi or K2 Split Bean, while offering a similar surfy carve. The Never Summer Swift Split thrives in powder and is designed for powerful carving, yet the directional shape doesn’t prohibit sending kickers and natural features into deep snow. The Swift Split’s ample float and retro-inspired shape allowed me to interact and flow with the mountain in new ways. Although it’s a bit on the heavier side and isn’t ideal for firm skin tracks, the Swift Split’s ride through powder makes it an excellent choice for deeper days on a plethora of terrain.